Please Note: There's an error in this pattern if you purchased it before 02/21/2013. Click here for the correction. Inspired by the flora found on the rocky coastlines of the Faroe Islands, the Salix Shawl shows off earthy browns in a range of lighter and darker shades. 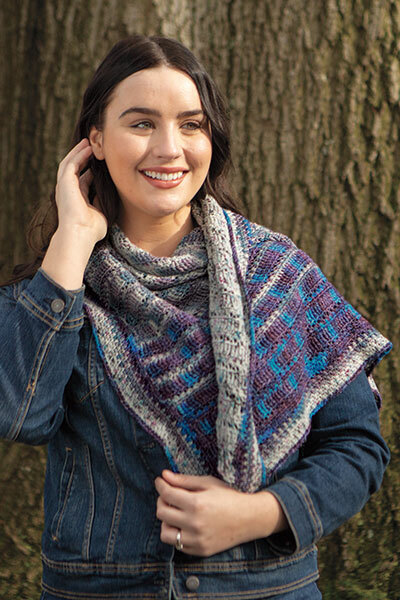 Complete with traditional Faroese shaping, the Salix shawl wings out at either edge to allow the shawl to wrap and sit comfortably around your shoulders. A scalloped border flows around the outside edge while a gusset lace panel runs down the center of the shawl. Knit from the bottom up and then decreased to the center top, a delicate Buttercup lace motif runs across the top edge border that is added on at the end. With traditional shaping and different lace motifs throughout, the Salix Shawl is sure to delight both new and advanced lace knitters. Oops! There's an error in this pattern if you purchased it before 02/21/2013. Click here for the correction.